Find a book that you like the print and color of the pages. Maybe the color of the cover. Although you will just see the edges. Can keep it simple. Just folded pages in half- toward each other. Started in the center and worked my way out to the edges. The pages form a rolodex of sorts- ready for tucking in all sorts of things. Printthe words Book of Graces in a font you like. You can use distress ink to age the paper. Then glue (Mod Podge, etc) to add it to the page. Connie Denninger used some Ann Voskamp quotes- from a retreat earlier this year and placed them on card stock. She added some dimensional embellishments to each card. Liz Murphy took prayers on slips of paper out of her prayer jar and added cardstock to them and now they are easy to see - and easy to bring to prayer time. Kate Su made a beautiful project at Creative Haven last month. Another guest made a book to hold greeting cards. 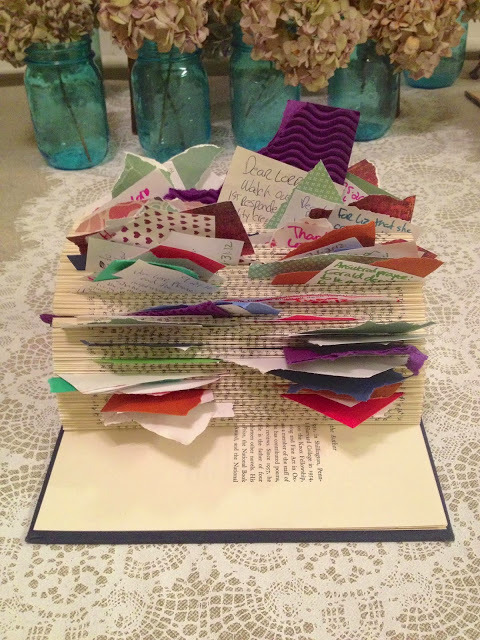 With a different fold, a book is ready to hold cards for a special celebration event- Birthday,Anniversary, or Just Because. Connie found these cool door knobs at Anthropologie which became her finishing touch. Just hot glued them in -wrapped paper around the bolt and slipped it into the space in the spine. Hobby Lobby carries great door knobs too. Maybe you would like to make a Book of Graces?